Merete, a Nord battlemage, is a Journeyman of the Mages Guild. She is part of a contingent of Battlemages sent to ambush Falcar once he surfaces from the ruins of Silorn. She only appears during the related quest and is identical in her schedule, inventory and spells to her compatriot Iver. Once the related quest is active, she will be found outside Silorn, patiently waiting for your arrival. After you have talked to Thalfin, she will make her way towards her and will then loiter around until you have assigned her to a particular placing. After you have given out your orders, she will dutifully carry them out and head to one of the two locations. She wears steel boots, cuirass and greaves with a mage's hood. Her only other possession is a meager amount of gold. In combat she relies on a steel mace and a special set of spells: three Destruction, one Alteration, one Mysticism and one Restoration. If you approach her before having talked to Thalfin, Merete will say "Thalfin's in charge. She's been waiting for you." After your talk with Thalfin, Merete will ask: "I'm ready to fight. Where do you need me?" Asking her about Abilities first is a good idea; she will then tell you about her preferred skills: "Well, I excelled in my studies in magic, especially large-scale spells. I'm pretty accurate with them, too. More accurate than swinging a sword." About her position in the Ambush, she will ask: "Do you want me to stay back, or stay up nearer to the door?" If you choose not to assign her a position yet, she will say: "Then just tell me when you've decided." If you order her to be up front, despite her spellcasting skills, a disappointed Merete will accept: "Okay, but remember. I'm not so good at close combat - you'll have to watch out for me." If you take advantage of her skills, she will be more optimistic: "Right. I'm on my way." Regardless of your choice, Merete will position herself as ordered and will be ready for battle: "I'm set. As soon as they're close enough, they're dead." If Merete survives the ambush, she will remain at Silorn indefinitely. 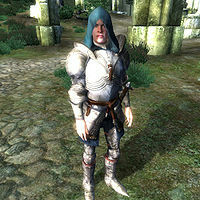 This issue has been addressed by version 2.2.0 of the Unofficial Oblivion Patch; she will be removed from the game when the quest is completed. This page was last modified on 22 November 2018, at 03:41.